Below are web site links to the regulating bodies for the sport of Table Tennis. You can click on each image to visit their website respectively in a new window. We strongly recommend that table tennis players in Ontario and across Canada become members of their respective provincial associations. The cost is minimal and the associations need the financial support to train Canadaâ€™s future champions. 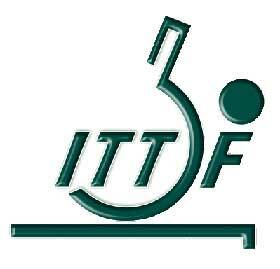 The International Table Tennis Federation(ITTF) is the governing body for all international table tennis associations. The role of the ITTF includes overseeing rules and regulations and seeking technological improvement for the sport of table tennis. The ITTF is responsible for the organization of numerous international competitions, including the World Table Tennis Championships that has continued since 1926. These rules are reviewed annually by the International Table Tennis Federation (ITTF) and any changes are normally implemented with effect from 1 September. The rules used in Olympic table tennis competition are the standard international rules as set out by the ITTF . The format of the competition was proposed by the ITTF and approved by the Olympic administration. Click here to learn more. The top of the net, along its whole length, shall be 15.25cm above the playing surface.The bottom of the net, along its whole length, shall be as close as possible to the playing surface and the ends of the net shall be as close as possible to the supporting posts.